How do I clean the ear buds on my headphones? Please remove any attached silicon tips. Then take a soft cloth the is lightly saturated with warm water and carefully wipe down the ear buds. Be careful not to allow liquid to penetrate the actual speaker. The silicone tips and cords can be cleaned the same way and allowed to dry before reinstalling. My Razer headset is out of warranty. Is there any way it can be repaired? Razer products are designed to work well beyond when the warranty has expired. However, If you feel your headset is having issues we first suggest trying the headset on another computer/source to insure the issue is with the headset and not something within the computer system or source. If you have narrowed the issue to the headset itself there is not really a cost effective repair center that would be able to assist you. Razer does make available some basic external spare parts at http://www.razerzone.com/store/gaming-accessories , but we are unable to supply any internal parts or repair guides. One of the speakers in my earbuds will not work or one side plays louder than the other. Because earbuds come in direct contact with your ears, wax can sometimes build up and cause issues with the audio quality and output levels. To clean your earbuds remove any silicone tips that are installed and follow the directions below. Take a soft cloth the is lightly saturated with warm water and carefully wipe down the ear buds. Be careful not to allow liquid to penetrate the actual speaker. If desired the silicone tips can also be cleaned in the same manner. Should you still have issues you can contact the Razer Support Team for further assistance. What are ear tips and bi-flanges? The Razer Adaro In-Ear’s silicon ear-tips are designed to fit snugly into your ear to keep music in your ear and at the same time keeping external sound out. Included in the packaging are ear-tips in 3 different sizes to ensure that you have the perfect fit for you Razer Adaro In-Ear earphones. Also included are bi-flanged ear-tips that offer the optimal amount of comfort and sound isolation through an additional silicon flap. A bi-flanged ear-tip creates a second layer of sealing, providing better sound isolation and fit over single-flap ear-tips. 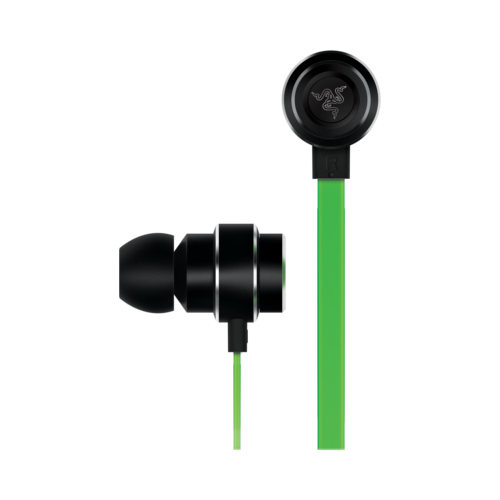 What accessories are included with the Razer Adaro In-Ear? The Razer Adaro In-Ear comes out of the box with a carrying pouch, small, medium and large eartips and a pair of bi-flanges. If you were unable to find the answer to your question(s) in our FAQ, please don’t hesitate to contact us here or call 1-888-697-2037. We cannot help you in modifying or disassembling your Razer product since that will void the manufacturer’s warranty on the unit. For a complete list of our current spare parts and accessories please click here. If the item you need isn’t listed, please don’t hesitate to contact our Customer Support team here. I have a coupon/promotional/gift voucher code for the RazerStore. Where can I enter the code so I can use it to purchase products? From your shopping cart page on the Razer Store, please check the box labeled “Enter Promo Code.” Enter the code into the box and click “Apply Code.” The total price after should reflect the discount. I recently placed an order on the Razer Store and it still shows my order is "In Process". When will my order ship? We are sorry if there are any delays in processing your order. The product may be out of stock or the order may be under protection/fraud review. Please don’t hesitate to check your order status at the RazerStore page by entering your information at the Order Status page. I think my Razer product is defective and would like an RMA/exchange. If you were unable to troubleshoot and resolve any issues you are having with the knowledgebase (FAQ) and you feel your product is still defective, please don’t hesitate to contact us here or call 1-888-697-2037. One of the features of my Razer Product does not work. If you’re unable to find an FAQ article that helps resolve the issue, please contact our customer support team here. User guides and product manuals are also available on the Support page. What are some examples of a “Proof of Purchase” to provide when initiating an RMA? A valid proof of purchase is defined as a dated sales receipt from an authorized Razer Reseller. The receipt must show the product description and price. Invoice slips and e-mail order confirmations can be considered on a case-by-case basis. Why does Razer require a proof of purchase? Razer must verify that the product is within the specified warranty period and that it was purchased from an authorized reseller. Products purchased from unauthorized dealers are often used, counterfeit, re-boxed, defective or gray market goods. These units may also not be designed and packaged to work in your country and may not meet all legal and safety requirements. Razer will not be able to honor a warranty on products purchased from an unauthorized dealer or that are out of the warranty period. If you purchased product from an unauthorized reseller, all support and warranty issues should be directed to that reseller.